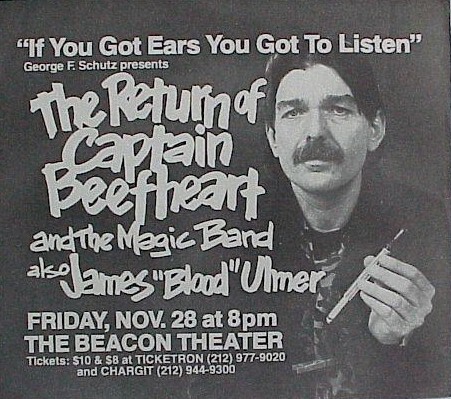 a highly parenthetical guide to unofficially circulating material of don van vliet, aka captain beefheart. location: an empty classroom at antelope valley jr. college in lancester, california. the earliest studio collaborations between don van vliet and frank zappa took place in studio z (pal studio) in 1962 - 1963.
concerts by captain beefheart & his magic band, by love and by big brother and the holding company. 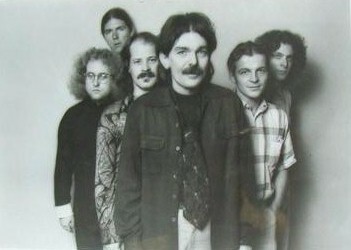 1966/06/18 Captain Beefheart phone interview : "American Bandstand"
parts bootlegged on "another chapter from the life and times of...", and bootlegged in their entirety on the "out there over there" bootleg, which gives a date of 1/24/68- recording date? Excellent 1969 Interview that was sent out to Radio Stations to promote Captain Beefheart and the soon to be released ablum TROUT MASK REPLICA. AUD, B, 45 min.. (Hendrix 'dedication' on 'Earth Angel' from Don & The Magic Band. 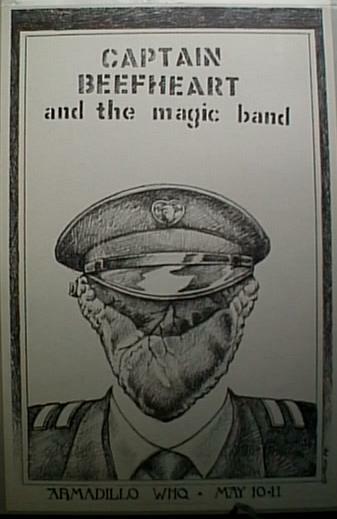 note: this was the first magic band to tour widely (with ry cooder), and imo the best touring lineup. versions of "flash gordon's ape" from this tour are incredible full-on jams. steal softly thru snow was only played as an instrumental live. 1971/01/15 concert Detroit, Michigan, "WABX -TV Tubeworks"
NB. "Old Black Snake" is a blues tune, AKA "Black Snake Moan", On this tour, it was accompanied by blues riffing by the band, all subsequent performances were acapella. 30 minutes got broadcast on French TV, Channel 2, TV Program Pop2, with several interview segments inserted. 1972/10/28 concert ‘town hall’, nyc, aud, b, 45 min. note: great setlist with lots of rarely performed tracks. "one red rose" slated for release on the upcoming 5cd set. 1972/--/-- concert west palm beach, florida, aud, b, 40 min. 1972/--/-- concert ‘university of medford’, massachusetts, aud, c, 70 min. 1973/--/-- concert roxy, la, aud, c+, 40 min. 1973/--/-- concert denver, aud, b-, 80 min. note: don's voice blown, mostly instrumental..
1973/--/-- concert ‘green's playhouse, glasgow’, "spring" 1973, aud, c, 90 min. Big Eyed Beans Jam, Upon the My Oh My, Crazy Little Thing, Full Moon Hot Sun, ?, Sweet Georgia Brown, ?, ? 1974/--/-- concert dallas, tx, , aud, 40 min. 1975/11/29 radio show kwst radio,?, a-, fm, 5 min. a reduction of the full-band backing the song received on the bongo fury tour. slated for release on the upcoming 5cd set. note: this band only played a few gigs locally & show the roots of the later incarnations of the magic band; wonderful atmosphere on these recordings, esp. 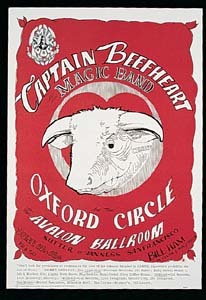 the second, where the band comes back for a blues encore..
also probably the only one of beefheart's bands (including the tragic band) not to play "abba zaba". "on tomorrow" and "moonlight on vermont" included sax solos on this tour. 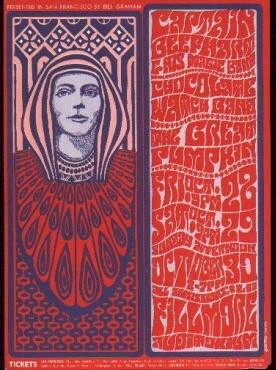 1976/12/-- concert ‘keystone corner’, san francisco, ca, b, aud, 80 min. "picture of mahavishnu" bootlegged on "if you got ears"
note: second gig this band ever played..
note: robert williams has said that a show at the hippodrome in paris on 11/11/77 was "one of his favorite shows". This could be it. 1977/11/12 concert washington, dc, b+, aud, 40 min. 1977/--/-- concert unknown venue, b, aud, 15 min. promotional photo issued by wb records. it was used for release of shiny beast/bat chain puller in the fall of 1978.
featured with the captain are magic band members rick redus, eric drew feldman, bruce fowler, robert williams" and jeff moris tepper. bootlegged as "flavor bud living"
- US TV Appearance, TV Rec A-, 8 min. AUD/Home Video Rec. A-/B+, 35 min. This interview starts out more as a conversation. Interviewer asks questions about various releases. By the time the interview settles down and good info is flowing out of the very hard to interview Captain, the tape runs out. 1981/01/21 concert ‘wow hall’, eugene oregon, aud, 85 min. 1980/--/-- concert ‘the venue’, london, uk, b, aud, 90 min. 1981/01/24 concert ‘old waldorf’, san francisco, b+, aud, 60 min. this section has been a fairly large mess, due to the convoluted and contradictory nature of much of the information surrounding these tracks; i'm attempting to clear it up as much as possible. radio broadcast, various boots), sbd/fm, a-, 30 min. 1964 Demo?, SBD, A, 5 min. Please Don't Take Our Love In Vain. NB. From CD reissue of "Legendary A&M Sessions"
Who Do Yo Think Your Foolin, NB. Alt Acetate version. Mirror Man, [#Alt Version 1968?] SBD, ?, 50 min. Trout Mask Replica House Tape, SBD, A-, 60 min. : *1st Gen Source Tape, NB. FULL Pre-studio recordings of Trout Mask Replica Tracks, mostly without Beefheart involvement. Parts bootlegged on "The Early Years 1959-1969" plus now in EDITED FORM on Revenant Box-Set. Lick My Decals Off Baby Backing Tracks 1970, SBD, A, 40 min. NB. The complete set of backing tracks remixed by Henry Kaiser to remove Beef heart’s voice, harp, and sax. Lick My Decals Off Baby, Doctor Dark, I Love You, You Big Dummy, Peon, Bellerin Plain, Woe-is-uh-Me-Bop, Japan in a Dishpan, I Wanna Find a Woman That'll Hold My Big Toe Till I Have To Go, Petrified Forest, One Red Rose That I Mean, The Buggy Boogie Boogie, The Smithsonian Institute Blues (or the Big Dig), Space-Age Couple, The Clouds Are Full of Wine (not Whiskey or Rye), Flash Gordon's Ape. Lick My Decals Off Baby OTs 1970, SBD, A, 20 min. NB Parts bootlegged on "If You Got Ears". Japan in a Dishpan (3 takes), Flash Gordon's Ape (2 takes) Well Well Well. Brown Star/Kiss Me Demos / Spotlight/Clear Spot OTs & BTs - 1970-3, SBD, A to B, 180+ min. Here I Always Am, (Don't Take Our Love In Vain) Kiss Where I Kain't, (Frying Pan, without vocal) Suzy Murder Wrist, Obenso Cinco, Witch Doctor Life, (alternate) Love Grip, No Flower Shall Grow, Your Love Brought Me To Life, That Little Girl, Campfires, 2 Rips In A Haystack, Pompadour Swamp, Kiss Me, (2 lips in a haystack) Don't Get Chicken Blues (Funeral Hill take 1) Funeral Hill take 2, Sun Zoom Spark Blues (2 x Acoustic and 1 x Electric), Scratch My Back (a few bars only), Going To The The Bottom (Border or Brazos), Keys To The Highway, Natural Charm (early "past sure is tense'), Harry Irene, Seam Crooked Sam (2 x versions, one w/ harmonica and spoken, one electric), Pompadour I and II (early Suction Prints), Dual and Abdul (guitar instrumental), Open Pins (guitar and marimba duet), Odd Job, Dirty Blue Gene (different words and music), Drink Paint Run Run, (different words and music, used later for Ice Cream for Crow), Flaming Autograph (instrumental), Semi-multicoloured Caucasian (early version), plus at least *12 Instrumentals, which feature the band without obvious Beefheart involvement but sound like Don wrote them. Train Crossing Track, 1975, SBD, B+, 2 min. The rhythmic inspiration for "Bat Chain Puller", w/Don whistling a bit. Bat Chain Puller Demos, 1975? Orig Bat Chain Puller CD + Paris ’72 Fm Radio Show, (Original, unreleased Virgin Promo Tape. ), 1975, SBD, A, 40 min. Bat Chain Puller (original, unreleased), 1975, SBD, A, 40 min. Bat Chain Puller, Seam Crooked Sam, Harry Irene, Poop Hatch, Flavour Bud Living, Brick Bats, Floppy Boot Stomp, A Carrot is as Close as a Rabbit Gets to a Diamond, Owed T'Alex (Carson City), Odd Jobs, 1010th Day of the Human Totem Pole, Apes-Ma. Hoboism w/Denny Walley, 1976, SBD, A-, 8 min. Hard Workin' Man (released "clean" version), 1978, SBD, A+, 5 min. Hard Workin' Man Promo LP Version. (movie version), 1978, SBD, A-, 5 min. Both Bootlegged on "If You Got Ears". The Light Reflected Off The Oceands Of The Moon / Hey Garland (w Sax instead of vocals), 1982, SBD, A+, 5 min. Where’s The Beef 1 + 2 – 2 x C 90s inc All know OTs from Henry Kaiser Mix Tapes, *1st Gen Source. US NTSC - PAL, B+, 8min. 1968/05 Cannes Beach. French TV Show “Bouton Rouge” BBC *Master Copy, 8 min. “Electricity”/ “Sure Nuff 'N Yes I Do” - *French Secam - BBC *Master Copy -Private Video. Trout Mask Photo Shoot (Cal Schenkal’s Home Movies) - 8mm film of Beefheart/Band playing. “Lick My Decals Off, Baby” Commercial, B&W, TV, B, 1 min. *Lick My Decals Off Baby promo 1970, PRO, B-, 5 min. 73 - Old Grey Whistle Test, 1973 - “Big Eyed Beans From Venus” Edit from Rainbow Theatre, 73. 1974/05/24 -Paris Pop. (Live Manchester 1974 - ?) NB. Show as above from Euro TV. OGWT ‘74 - Studio Live. “Upon The My-Oh-My” / “This Is The Day.” A, 8min. 1980/12/10 - Private Home Video “Mudd Club, NYC” - AUD, B+, 40 min. Shot by Gary Lucas in front of an extremely small audience, contains the only known performance of "Making Love To A Vampire With A Monkey On My Knee". NBC Profile 1980, TV, B, 10 min. Ice Cream for Crow Video, PRO, A-, 5 min. “Eyewitness.” Los Angeles TV Segment 1982, TV, B-, 7 min. PM Magazine, 1982, TV, B, 10 min. “Late Night With David Letterman. '82” US NTSC, A-, 10 min. “Late Night With David Letterman.” '83, TV, A, 10 min. San Francisco News 1986 - US NTSC, B, 2 min. 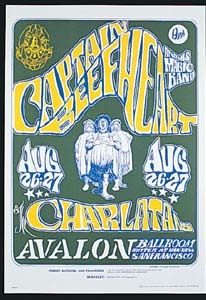 “Late Show” -Beefheart Preveiw” - Unshown 30min Edit of “The Man Formerly Known As...’ inc Brighton Art Ex Opening etc. A, *Master Copy from BBC. broadcast at 11:15 PM on Aug. 19, 1997 on BBC2. 1967 safe as milk radio ad, fm, b, 2 min. 1969 reprise interview w/meatball fulton, july, sbd, b+, 110 min. 1969 tmr comments w/zappa, fm, d+, 5 min. 1970 lick my decals off baby radio spots, fm, b+, 10 min. 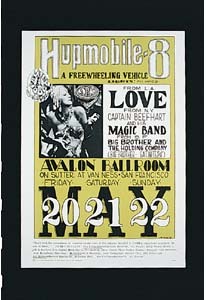 1971 tour promo, fm, a-, 2 min. 1971 philadelphia interview w/tearson, sbd, b?, 20 min. 1971 vancouver, bc interview, fm, a-, 30 min. 1972/05 radio london int. w/andy hall, fm, b+, 11 min. 1973/04/24 john peel interview, fm, b, 20 min. 1973 vancouver, bc restaurant interview, fm, a-, ? min. 1973 khsu arcata, ca phone interviewfm, b, 22 min. 1975/04/18 wplr int. w/zappa, new haven, ct, fm, b+, 12 min. 1975/04/23- lecture w/zappa & george duke, sbd, a, 135 min. 1975/11/29 kwst interview w/fz, fm, b+, 45 min. 1978 dr. demento interview, fm, a, 20 min. 1979/08/30 wxpn int. w/cal schenkel, fm, b, 30 min. 1980 john peel interview, fm, b+, 5? min. 1980 holland interview, fm, b+, 15 min. 1980/12/11 private interview, b, 40 min. 1987/10/18 kcrw int. w/kristine mckenna, santa monica, ca, fm, a, 50 min. unknown interview, recent, sbd, a, 5 min. about tmr fish-head; don does not sound well. Interview recorded for a special about Captain Beefheart airing on Radio 4, Holland. As this is the uncut/unedited raw version there are several pauses of silence during the conversation/interview. There are no drop outs or edits. Enjoy.